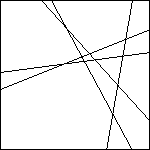 Simple line arrangements 1 1 6 43 922 38'609 3'111'341 ? 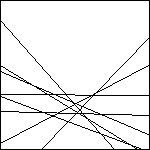 The table shows the numbers of combinatorially different simple line arrangements up to 9 lines (i.e., of uniform realizable dissection types of dimension 2 up to cardinality 9). 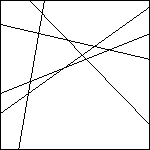 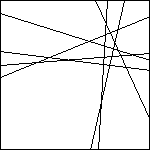 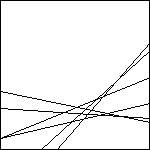 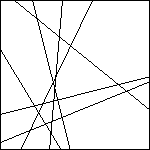 A simple line arrangement is a line arrangement in general position: no three lines meet in a common point and no two lines are parallel. 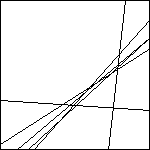 The corresponding files contain realizations of all simple line arrangements in the following format: The first line of the file gives the dissection type encoded as the chirotope of the corresponding oriented matroid (where we label and orient the lines such that the chirotope is lexicographically maximal, according to the format used in Lukas Finschis work on oriented matroids). 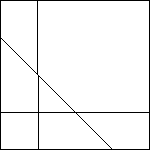 The next n-1 lines of the file stand for the n-1 lines of a realizing line arrangement, every line containing three numbers a b c seperated by a blank. 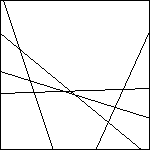 The numbers are to be interpreted as the coefficients of a line, i.e., a b c stands for the line ax + by + c = 0. 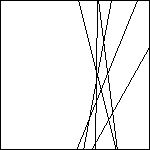 The arrangements are sorted lexicographically with respect to their chirotope. 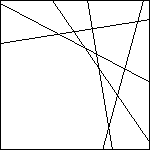 The projective oder types were obtained by going through the (affine) order type data base provided by O. Aichholzer, F. Aurenhammer, and H. Krasser and filtering out pointsets which have the same projective order type as an other pointset already obtained. 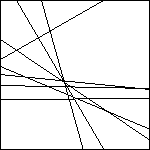 For each of them we go through all n possibilities to fix one point as the point at infinity resulting in n different line arrangements of n-1 lines. 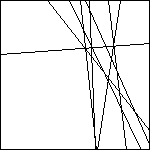 However, some of these n line arrangements can be combinatorially equivalent, so we have to filter out line arrangements with the same dissection type, keeping only one of each class. 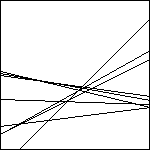 This results in the list of line arrangements. 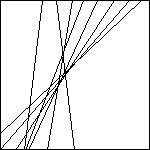 For n=10, we used a different kind of representative for each projective class, as it gets to costy to go through all possible relabellings. 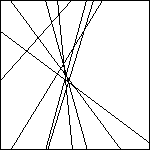 For every possible reorientation of the points we sort them in counter-clockwise order seen from a point on the convex hull. 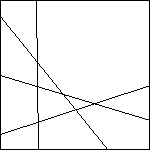 Among the different points on the convex hull we take the one resulting in a lexicographically maximal chirotope. 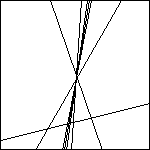 Note that this reorientation and relabelling in general does not result in the lexicographically maximal chirotope, i.e., we do not get the matroids as in Finschi's list. 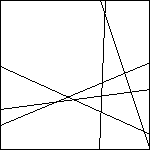 But this method is guaranteed to find a unique member of the class, which is all we need to filter out point sets which have the same projective type as another point set already obtained. 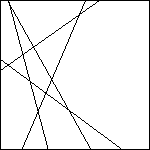 For 3 and 4 lines in general position there is only one possible arrangement.